In September 2017, we held the 10th Waud Wine Club Tour du Vin and it is safe to say it did not dissapoint. 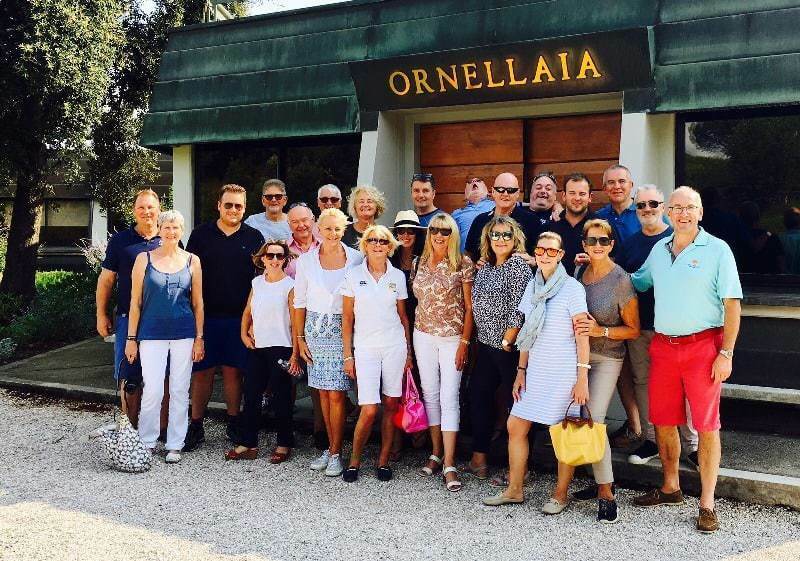 Our biggest turnout ever with 23 tourists flying into Tuscany for 3 days of wine tasting at some of the most iconic vineyards in the world. Our first visit was to the famous Frescobaldi vineyard of Castello di Nipozzano. They are producing a range of Chianti, Super Tuscan (IGT) and Brunello wines. The Frescobaldi family are over 700 years old and are steeped in history – with Nipozzano being their main family home. After a tour of the Castello and cellars, we sat down for one of the most impressive tastings the TDV have ever experienced. We were treated to the following fabulous selection of wines, some of which we plan to stock for Christmas: Pomino Bianco 2016, Pomino Benefizio Riserva 2015, Nipozzano Chianti Rufina 2014, Nipozzano Vecchie Viti Chianti Rufina 2014, Montesodi 2013, Castelgiocondo 2012 and Mormoreto 2013. After an enjoyable overnight stay (where we drank fantastic Castellare Chianti and Le Macchiole Paleo at dinner!) we headed to our morning tasting at Allegrini’s San Polo vineyard that we eventually managed to find near the famous town of Montalcino. Head wine maker Riccardo Fratton walked us out around the vines and then into their cellars before a very interesting technical tasting of his wines. We tasted; Rubio IGT Rosso Toscano 2015, Rosso di Montalcino DOC 2015, Brunello di Montalcino DOCG 2012 and Brunello di Montalcino Riserva DOCG 2010. Here again we have found some wines that we intend to list for Christmas. After lunch in Montalcino, the tour moved to the South West corner of Tuscany to the famed vineyard of Tua Ruta – where we were shown around by the lovely Chiara, before a tasting with owner and head winemaker Stefano Frascolla. A relatively young winery of only 40 hectares producing world renowned wines including; Rosso dei Notri 2015, Perlato del Bosco 2014 and Giusto di Notri 2015. Watch out for some of these on our list. Our hotel on the west coast was Tombolo Talasso Resort in Marina di Castagneto Carducci, that interestingly is owned by the Antinori family for the first of a two night stay. We walked into town for dinner. Day 3 of the tour was the final day’s tasting in the famous sub-region of Bolgheri, home of the majority of Super Tuscan wines. We arrived for a 1030 morning tasting at one of Allegrini’s other vineyards – Poggio al Tesoro. We had a tour of the vineyard with Valentina Martinello and head winemaker Lorenzo Fortini. These wines we have been familiar with for a while as we have stocked them in the club. After a tour of the vineyard, just avoiding the serious rain, we headed back inside for a fabulous and raucous tasting of: Cassiopea Rose 2016, Cassiopea Rose Pagus Cerbaia 2016, Solosole 2016, Solosole Pagus Camilla 2015, Mediterra 2013, a new wine in their range – Il Seggio 2014, Sondraia 2013 and then finally the jewel in their crown: Dedicato a Walter 2013. After our morning’s drinks party with Poggio al Tesoro, we popped down the road to Tenuta San Guido for lunch, where they make the famed Sassicaia. This was an excellent lunch where we enjoyed Grattamaco Vermentino 2015, then Sassicaia’s second wine – Guidalberto 2014. All in all, a very successful tour with a superb touring party – a fine way to spend our 10th Anniversary tour. Now to look forward to 2018 where we intend to tour South Africa in February (11th to 19th) and then to Champagne and Alsace in September (6th to 9th). If you are interested in joining one of our tours, contact charles@waudwineclub.com for more information. Brunello di Montacino is argueably the finest expression of the Sangeovese in the entire of Italy. This is because they have incredibly strict regulations. You will notice after many of the wines mentioned above, that IGT, DOC and DOCG are sometimes written after the wines. Denominazione di Origine Controllata e Garantita (DOCG) is the highest classification Italian wines can be awarded. It means that there are controlled production methods and guaranteed wine quality with each bottle. Denominazione di Origine Controllata (DOC): DOC wines are much more commonly found. The rules governing quality and authenticity are still very strict, but they’re a little more generous than those for DOCG status. For instance, the geographic zone might be a little bigger or the rules about what kind of grapes might be a little more relaxed. Indicazione Geografica Tipica (IGT): This designation was created a little after the DOC and DOCG designations in order to accommodate growers who couldn’t meet all the DOC or DOCG regulations for one reason or another, but were still producing great wines.